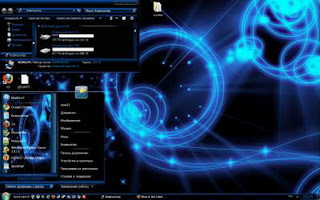 First you need a universel theme patch to apply third party Styles (INCLUDED WITH THE PACK) and restart your computer. Now Go to Desktop Personalize & apply Blue Theme. Now to change the start orb, go in the "Start Orb Changer" folder and run Windows 7 Start Button Changer v 2.6.exe. Now click Select and Change Start Orb. Find in that same folder the 2 recommended start orbs, use on of them.